Alan Stubbs has revealed he’s not going to waste his time by calling Rangers boss Mark Warburton for a third time to tell him Scott Allan is not for sale. 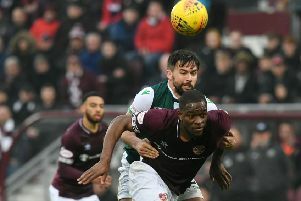 Rangers’ refusal to take no for an answer, a first bid of £175,000 upped to £225,000 and now £280,000, is increasingly exasperating those in charge at Easter Road, but they are adamant their stance on the 23-year-old won’t change and that he’ll remain their player after the transfer window closes at the end of the month. “I think we have been very clear from day one, we will not do business with Rangers. That will not change, that will be the same on September 1. Allan, pictured left, has made his wish to join Rangers known, the former Dundee United and West Brom player having handed in a written transfer request, but Stubbs said: “The club is the most important thing, the team is second behind that and that will always be the case. The individual’s needs do not outweigh the club’s or the team’s. While Warburton himself has repeatedly claimed it would be “disrespectful” to speak about another club’s players and insisted a fourth bid for Allan was “up to the powers that be”, Stubbs believes there have been plenty of others willing to chip in on Rangers behalf. He said: “What we have done is in the best interests of the football club. Obviously Mark is right saying he does not want to speak about it, but I see lots of ambassadors for the football club have managed to speak about it – maybe that’s a way round it. “I think the publicity has been quite one-sided, it’s been as if we would give in. Maybe they do not realise how serious we are. “I think some people may think that automatically we should just, as a football club, say ‘okay, he can go’. But I don’t think people have respected our position as a football club in what we are doing. I think sometimes people think what we are doing is wrong – I think we have every right. Stubbs has constantly stated he’s intent on strengthening his squad further rather than allowing players to leave, a fact underlined by the payment of a six-figure sum to secure the signature of former St Mirren youngster John McGinn.